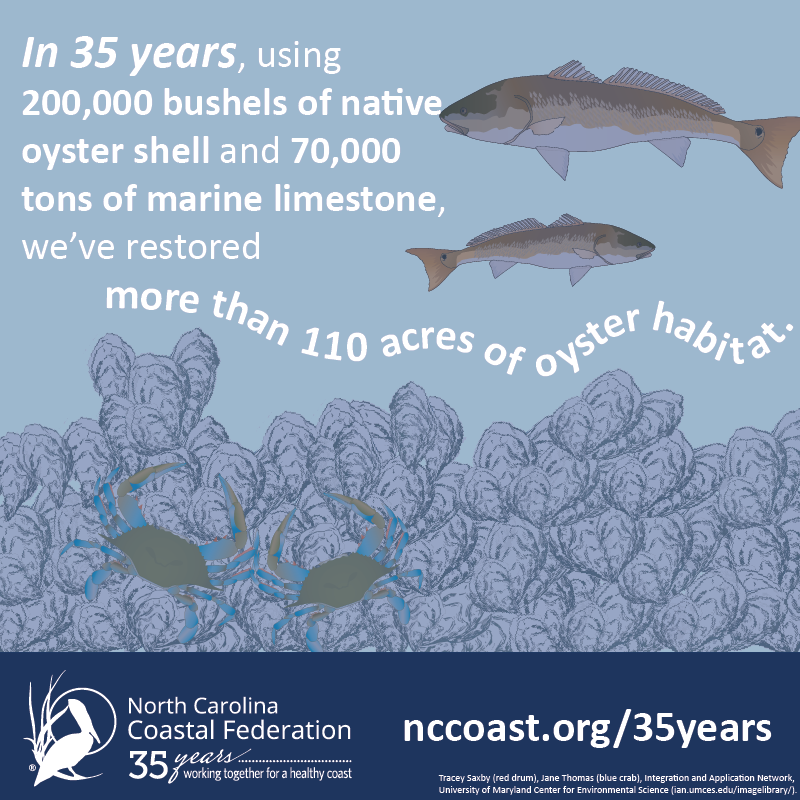 Today is National Oyster Day, and here at the North Carolina Coastal Federation we know there’s a lot to celebrate about these multitasking bivalves. Not only are they a delicacy and a sustainable protein source, oysters are also filter feeders that naturally clean coastal waters. They support North Carolina’s coastal economy as well. One adult oyster can filter up to 50 gallons of water per day, removing harmful pollutants, sediment and excess algae from the water. 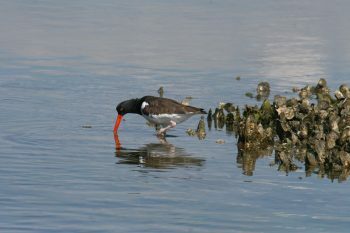 Oysters provide habitat for important types of North Carolina seafood, including blue crabs and finfish. These are valued at more than $62 million annually. One oyster reef can provide homes for an estimated 300 different adult and juvenile organisms, including shrimp, southern flounder, blue crabs and clams. 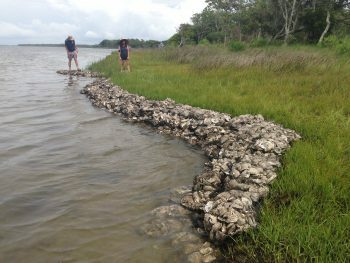 When used in living shorelines, bags of oyster shells help control shoreline erosion while providing habitat. Oyster shells are one of the best substrates for spat, or juvenile oysters, to attach and grow on. 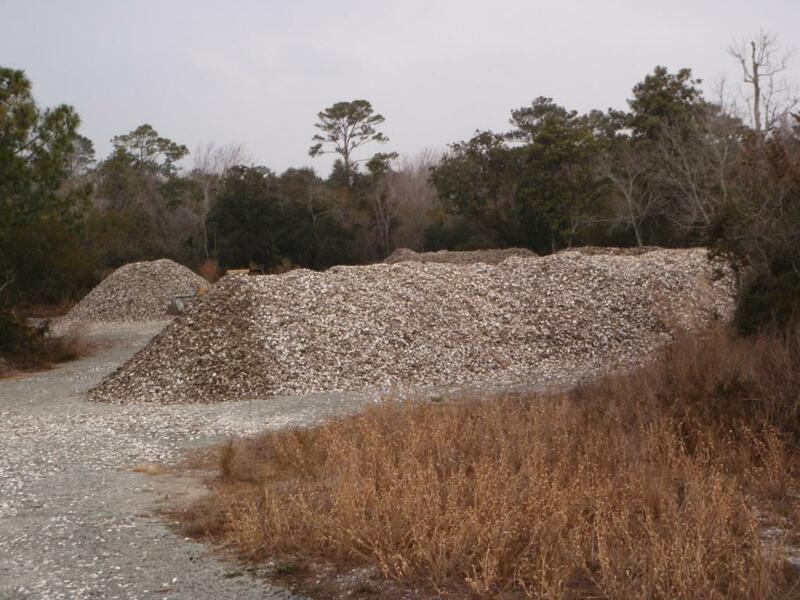 That’s why the federation and the North Carolina Division of Marine Fisheries encourage people and restaurants to recycle oyster shells. Oyster restoration projects are more like large-scale construction projects than many realize. 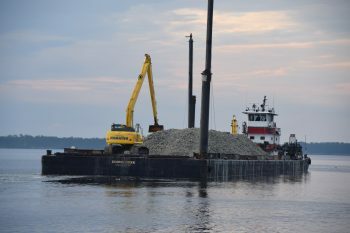 The federation has been involved in several projects that have provided work for contractors, construction workers, barge operations, university researchers, scientists, state agency employees and fishermen. 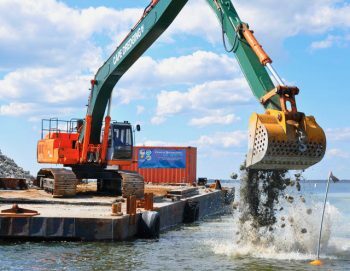 Its most recent project restored 15 acres of oyster reef to Pamlico Sound as part of the Senator Jean Preston Oyster Sanctuary Network. Cleaner water and more fish habitat benefits both the fishing and tourism industries. Want more information about what’s being done to restore oysters and to inform people about oysters’ importance? Check out these resources. Join the North Carolina Coastal Federation. Donate to the 50 Million Oyster Initiative. 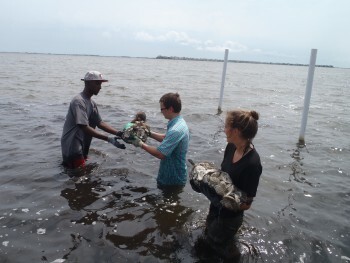 Thank your state representatives for supporting oyster restoration. 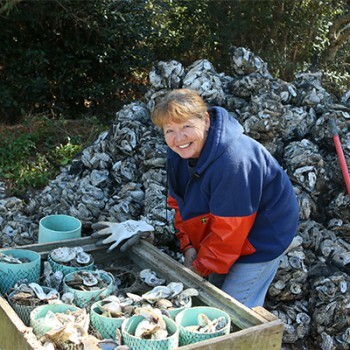 Volunteer at one of our living shoreline or oyster shell bagging workdays. Check the events calendar for upcoming opportunities. Click to enlarge the photos below to see some of the ways we work with oysters. 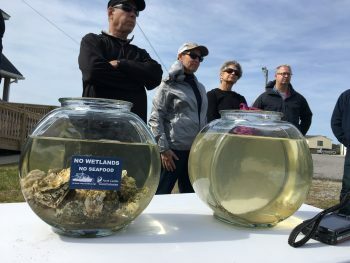 Two tanks of water from the sound — the one with oysters was visibly cleaner by the time people returned from the Oyster Eco Tour in March. Ted Wilgis, coastal education coordinator at the Wrightsville Beach office, is hard at work. 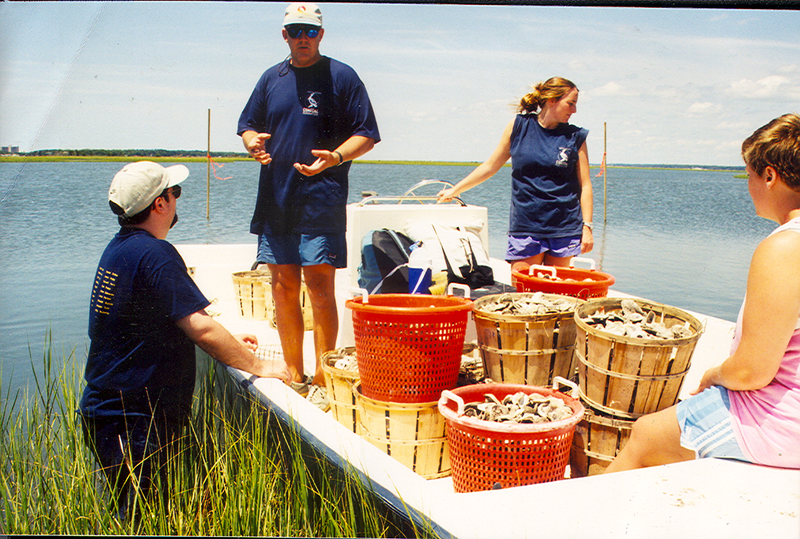 A photo from the 2009 oyster restoration project that was funded by the American Recovery and Reinvestment Act. Volunteers placing oyster shell bags. An oyster catcher is one of the many organisms that benefits from oyster restoration. The oyster shell stockpile site at Morris Landing in Holly Ridge. Volunteers work on a living shoreline in Pine Knoll Shores that is using oyster reefs as part of its erosion control.